A Baku district court today extended the detention of Khadija Ismayilova by an additional three months, until 24 August. Khadija Ismayilova, one of Azerbaijan’s most celebrated investigative journalists, today had her appeal over a criminal libel conviction postponed indefinitely. In February Ismayilova was fined 2,500 manat (£1,500) for defamation of former opposition leader Elman Hasanov. The decision to postpone her appeal comes as she enters her six month in pretrial detention over a number of separate charges, dismissed as spurious and trumped up by international human rights organisations. Ismayilova was arrested on 5 December on charges of inciting suicide and given two months in pretrial detention, which has since been extended twice, last in early March. The initial charge has in recent weeks been further discredited by the backtracking of the accuser, Tural Mustafayev. In April Mustafayev said in a radio interview that he no longer stands by the letter he wrote in November 2014, accusing Ismayilova of inciting him to suicide, and that he had written to the head public prosecutor to retract his complaint. He says he had first tried in December to withdraw the complaint. Then in May, he accused the city prosecutor’s office in Baku of using his suicide attempt as an opportunity to target Ismayilova. “I was forced to write the letter. They blackmailed me. They said they will release secret camera recordings of my apartment if I didn’t comply,” he said in a video posted online, reports Radio Free Europe/Radio Liberty. Ismayilova was handed down further charges following her arrest. According to her lawyer, she also stands accused of embezzlement, illegal business, tax evasion and abuse of power. Together, the charges carry a possible sentence of 12 years. Ismayilova has on a number of occasions taken on President Ilham Aliyev and those close to him through her reporting, and has faced harassment and smear campaigns directly linked to her work. Among other things, ahead of the 2012 Eurovision Song Contest, she uncovered how the Aliyev family profited from the building of the Baku concert hall where the final was to be hosted. 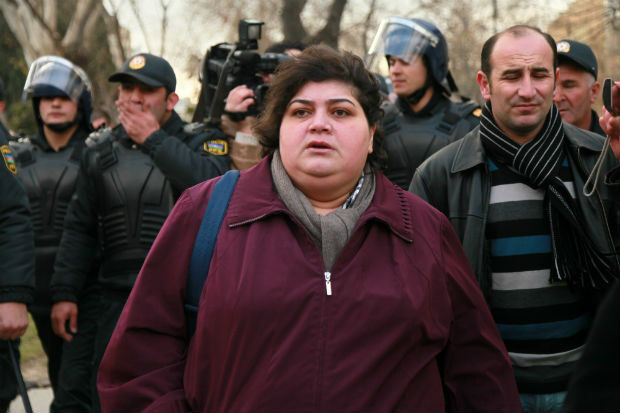 Ismayilova’s case is part of a an ongoing crackdown against Azerbaijan’s most prominent critical journalists and activists. With just weeks to go until the start of the European Games, hosted in the capital Baku, civil society in Azerbaijan has been almost completely silenced. Human rights lawyer Intigam Aliyev and democracy campaigner Rasul Jafarov, also known for their criticism of the Aliyev government, were recently sentenced to seven and a half and six and a half years in prison respectively, on charges similar to those Ismayilova faces. The latest development in Ismayilova’s case come just days after she was given the PEN/Barbara Goldsmith Freedom to Write Award. “Khadija Ismayilova knows no fear. Again and again she has unearthed and exposed stories that have cast a harsh light on widespread corruption and self-dealing at the highest levels of the Azeri government,” said PEN Executive Director Suzanne Nossel.